Corey Nelson may get a shot at the Eagles' third linebacker spot. 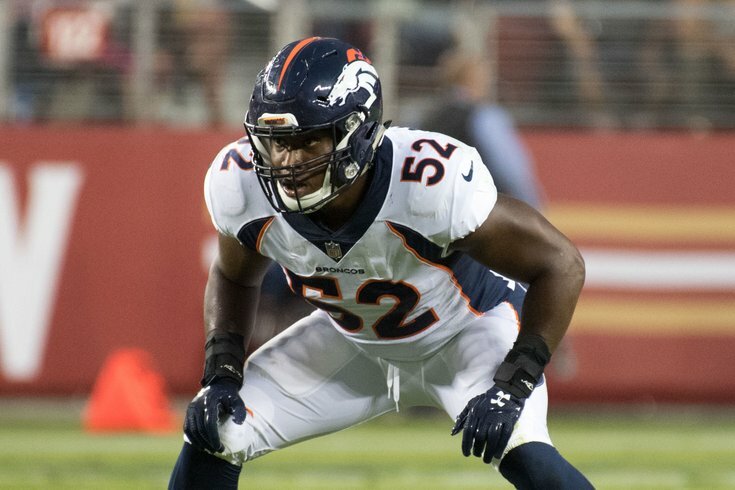 According to Josina Anderson of ESPN, the Eagles are set to sign free agent linebacker Corey Nelson (26 in April), who formerly played with the Denver Broncos. I'm told #Broncos LB Corey Nelson intends to sign a 1-year deal with the #Eagles, per source. Nelson is a former seventh-round pick in 2014 out of Oklahoma. He appeared in all 16 games for the Broncos in 2014, 2015, and 2016, starting five games in 2016. Interestingly, like the Eagles' other reported free agent signing, Haloti Ngata, Nelson's 2017 season was cut short after five games due to a bicep tear. Nelson is undersized at 6'1, 226, but he has good speed. In 2016, he had 67 tackles and 5 pass breakups. According to an interesting tweet by Nicki Jhabvala of The Denver Post, Nelson signed in Philly over Denver to take on a "larger role." The Broncos, I'm told, matched the money Corey Nelson will recieve in Philly. But Nelson wanted a larger role. At the start of last season, Vance Joseph said he considered Nelson a starter, much like Bradley Roby as the third corner. The Eagles are not expected to re-sign starting linebacker Nigel Bradham, so it's possible that the Eagles indicated to Nelson that he will have a shot at the third linebacker spot alongside Jordan Hicks and Mychal Kendricks.